I explain some final information and tricks and definitive guidance so you can totally stop the DDoS attacks affecting so many sites. After effectively mitigating the previous DDoS Torrent attack to a point that was no longer harmful, even with thousands of requests, I had another surprise. It was the morning when I had a brutal increase of the attacks and a savage spike of traffic and requests of different nature, so in addition to the BitTorent attack that never stopped but was harmful. I was on route to the work when the alarms raised into my smartphone. I stopped in a gas station, and started to fix it from the car, in the parking area. Service was irresponsible, so first thing I did was to close the Firewall (from the Cloud provider panel) to HTTP and HTTPS to the Front Web Servers. Immediately after that I was able to log in via SSH to the Servers. I tried to open HTTPS for our customers and I was surprised that most of the traffic was going through HTTPS. So I closed both, I called the CEO of the company to give status, and added a rule to the Firewall so the staff on the company would be able to work against the Backoffice Servers and browse the web while I was fixing all the mess. I also instructed my crew and gave instructions to support team to help the business users and to deal with customers issues while I was stopping the attack. 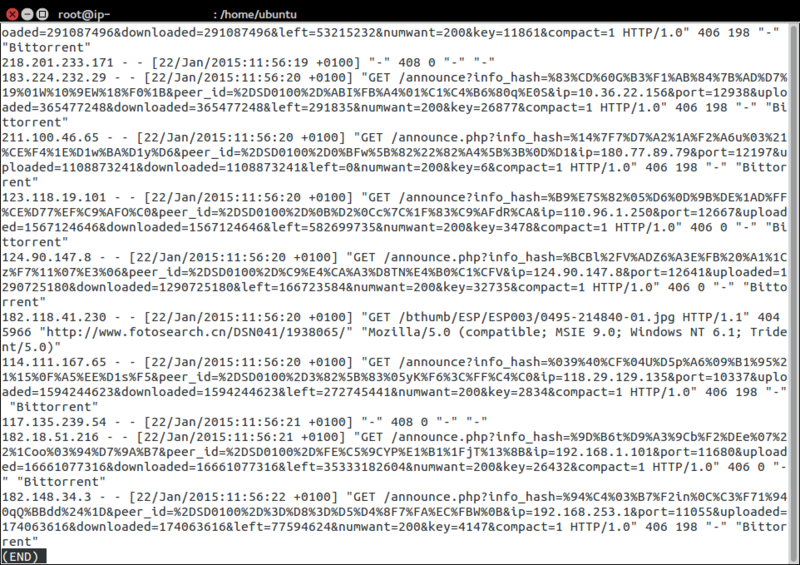 I saw a lot of new attacks in the access logs. For example, requests like coming from Android SDK. Weird. 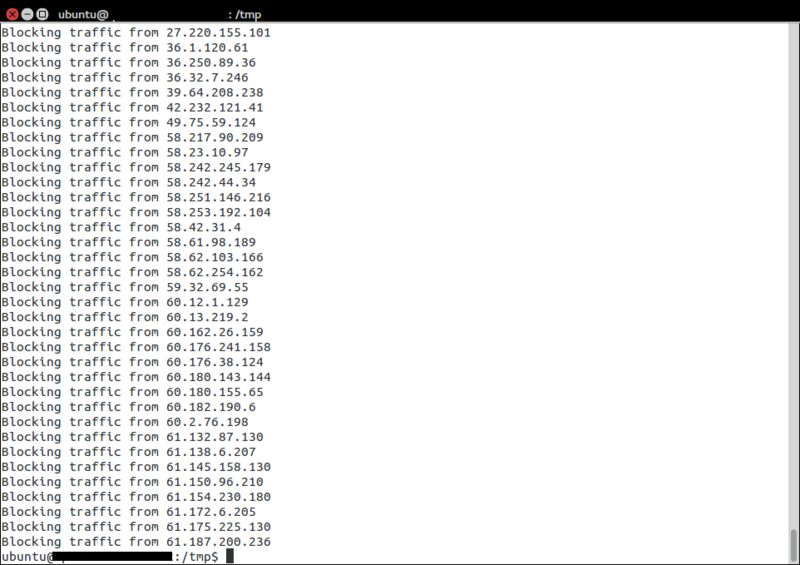 Then, with the cron blocking the ip addresses all improved. Problem was that I was receiving thousands of requests per second, and so, adding those thousands of Ip’s to IPTABLES was not efficient, in fact was so slow, that the process was taking more than an hour. The server continued overwhelmed with thousands of new ip’s per second while it was able to manage to block few per second (and with a performance adding ip’s degraded since the ip number 5,000). It was not the right strategy to fight back this attack. 119.63.196.126 - - [01/Feb/2015:07:15:48 +0100] "GET /video/Ig3ebdqswQI/images/avatar/0114.jpg HTTP/1.1" 404 499 "-" "Baiduspider-image+(+http://www.baidu.com/search/spider.htm)\\nReferer: http://image.baidu.com/i?ct=503316480&z=0&tn=baiduimagedetail"
180.153.206.20 - - [30/Jan/2015:06:34:34 +0100] "GET /contents/all/tokusyu/skin_detail.html HTTP/1.1" 404 492 "-" "Mozilla/4.0"
180.153.206.20 - - [30/Jan/2015:06:34:35 +0100] "GET /contents/gift/ban_gift/skin_gift.js HTTP/1.1" 404 490 "http://top.dhc.co.jp/contents/gift/ban_gift/skin_gift.js" "Mozilla/4.0"
220.181.108.105 - - [30/Jan/2015:06:35:22 +0100] "GET /image/DbLiteGraphic/201405/thumb_14773360.jpg?1414567871 HTTP/1.1" 404 505 "http://image.baidu.com/i?ct=503316480&z=0&tn=baiduimagedetail" "Baiduspider-image+(+http://www.baidu.com/search/spider.htm)"
118.249.207.5 - - [30/Jan/2015:06:39:26 +0100] "GET /widgets.js HTTP/1.1" 404 0 "http://www.javlibrary.com/cn/vl_star.php?&mode=&s=azgcg&page=2" "Mozilla/5.0 (MSIE 9.0; qdesk 2.4.1266.203; Windows NT 6.1; WOW64; Trident/7.0; rv:11.0; QQBrowser/8.0.3197.400) like Gecko"
120.197.109.101 - - [30/Jan/2015:06:57:20 +0100] "GET /ads/2015/20minutes/publishing/stval/3001.html?pos=6 HTTP/1.1" 404 542 "-" "20minv3/6 CFNetwork/609.1.4 Darwin/13.0.0"
101.226.33.221 - - [30/Jan/2015:07:00:04 +0100] "GET /?LR_PUBLISHER_ID=29877&LR_SCHEMA=vast2-vpaid&LR_PARTNERS=758858&LR_CONTENT=1&LR_AUTOPLAY=1&LR_URL=http://play.retroogames.com/penguin-hockey-lite/?pc1oibq9f5&utm_source=4207933&entId=7a6c6f60cd27700031f2802842eb2457b46e15c0 HTTP/1.1" 200 11783 "http://play.retroogames.com/penguin-hockey-lite/?pc1oibq9f5&utm_source=4207933&entId=7a6c6f60cd27700031f2802842eb2457b46e15c0" "Mozilla/4.0"
180.153.206.20 - - [30/Jan/2015:07:03:10 +0100] "GET /?metric=csync&p=3030&s=6109924323866574861 HTTP/1.1" 200 11783 "http://v.youku.com/v_show/id_XODYzNzA0NTk2.html" "Mozilla/4.0"
180.153.114.199 - - [30/Jan/2015:07:05:18 +0100] "GET /?LR_PUBLISHER_ID=78817&LR_SCHEMA=vast2-vpaid&LR_PARTNERS=763110&LR_CONTENT=1&LR_AUTOPLAY=1&LR_URL=http://www.dnd.com.pk/free-download-malala-malala-yousafzai HTTP/1.1" 200 11783 "http://www.dnd.com.pk/free-download-malala-malala-yousafzai" "Mozilla/4.0"
60.185.249.230 - - [30/Jan/2015:07:08:20 +0100] "GET /scrape.php?info_hash=8%e3Q%9a%9c%85%bc%e3%1d%14%213wNi3%28%e9%f0. HTTP/1.1" 404 459 "-" "Transmission/2.77"
180.153.236.129 - - [30/Jan/2015:07:11:10 +0100] "GET /c/lf-centennial-services-hong-kong-limited/hk041664/ HTTP/1.1" 404 545 "http://hk.kompass.com/c/lf-centennial-services-hong-kong-limited/hk041664/" "Mozilla/5.0 (compatible; MSIE 9.0; Windows NT 6.1; Trident/5.0); 360Spider(compatible; HaosouSpider; http://www.haosou.com/help/help_3_2.html)"
36.106.38.13 - - [30/Jan/2015:07:18:28 +0100] "GET /op/icon?id=com.wsw.en.gm.ArrowDefense HTTP/1.1" 404 0 "-" "Apache-HttpClient/UNAVAILABLE (java 1.4)"
180.153.114.199 - - [30/Jan/2015:07:19:12 +0100] "GET /?metric=csync&p=3030&s=6109985239380459533 HTTP/1.1" 200 11783 "http://vox-static.liverail.com/swf/v4/admanager.swf" "Mozilla/4.0"
220.181.108.139 - - [30/Jan/2015:07:47:08 +0100] "GET /asset/assetId/5994450/size/large/ts/1408882797/type/library/client/WD-KJLAK/5994450_large.jpg?token=4e703a62ec08791e2b91ec1731be0d13&category=pres&action=thumb HTTP/1.1" 404 550 "http://www.passion-nyc.com/" "Baiduspider-image+(+http://www.baidu.com/search/spider.htm)"
120.197.26.43 - - [29/Jan/2015:00:04:25 +0100] "GET /c/5356/cc.js?ns=_cc5356 HTTP/1.1" 404 11676 "http://m.accuweather.com/zh/cn/guangzhou/102255/current-weather/102255?p=huawei2" "HUAWEI Y325-T00_TD/V1 Linux/3.4.5 Android/2.3.6 Release/03.26.2013 Browser/AppleWebKit533.1 Mobile Safari/533.1;"
120.197.26.43 - - [29/Jan/2015:00:05:32 +0100] "GET /c/5356/cc.js?ns=_cc5356 HTTP/1.1" 404 11674 "http://m.accuweather.com/zh/cn/guangzhou/102255/weather-forecast/102255" "HUAWEI Y325-T00_TD/V1 Linux/3.4.5 Android/2.3.6 Release/03.26.2013 Browser/AppleWebKit533.1 Mobile Safari/533.1;"
117.136.1.106 - - [29/Jan/2015:06:35:05 +0100] "GET /v2.2/237613769760602?format=json&sdk=android&fields=supports_attribution%2Csupports_implicit_sdk_logging%2Cgdpv4_nux_content%2Cgdpv4_nux_enabled%2Candroid_dialog_configs HTTP/1.1" 404 6304 "-" "FBAndroidSDK.3.20.0"
117.136.1.106 - - [29/Jan/2015:06:35:11 +0100] "GET /v2.2/237613769760602?format=json&sdk=android&fields=supports_attribution%2Csupports_implicit_sdk_logging%2Cgdpv4_nux_content%2Cgdpv4_nux_enabled%2Candroid_dialog_configs HTTP/1.1" 404 6308 "-" "FBAndroidSDK.3.20.0"
117.136.1.107 - - [29/Jan/2015:06:35:36 +0100] "GET /v2.2/1493038024241481?fields=name,supports_implicit_sdk_logging,gdpv4_nux_enabled,gdpv4_nux_content,ios_dialog_configs,app_events_feature_bitmask&format=json&sdk=ios HTTP/1.1" 404 6731 "-" "FBiOSSDK.3.22.0"
180.175.55.177 - public [29/Jan/2015:07:40:23 +0100] "GET /public/checksum?a=8&t=p&v=2.5.0&c=d62c8d04f74057d51872d5dc5cdab098 HTTP/1.0" 404 39668 "https://rc-regkeytool.appspot.com/public/checksum?a=8&t=p&v=2.5.0&c=d62c8d04f74057d51872d5dc5cdab098" "Mozilla/5.0 (iPhone; U; CPU like Mac OS X; en) AppleWebKit/420+ (KHTML, like Gecko) Version/3.0 Mobile/1C28 Safari/419.3"
So, I was seeing requests that typically do applications like Facebook, smartphones with Android going to google store, and a lot of other applications and sites traffics, that was going diverted to my Ip. So I saw that this attack was an attack associated to the ip address. I could change the ip in an extreme case and gain some hours to react. Some fields were replaced with ‘deleted’ for security. PING appspot.l.google.com (74.125.24.141) 56(84) bytes of data. So that was it, connections were arriving to the Server/Load Balancer requesting addresses from Google, Facebook, thepiratebay main tracker, etc… tens of thousands of users simultaneously. Clearly there was a kind of DNS spoofing attack. And looking at the ACCEPT_LANGUAGE I saw that clients were using Chineses language (zh-cn). Changing the ip address will take some time, as some dns have 1 hour or several hours of TTL to improve page speed of customers, and both ip’s have to coexist for a while until all the client’s dns have refreshed, browsers have refreshed their cache of dns names, and dns of partners consuming our APIs have refreshed. You can have a virtual host just blank, but for some projects your virtual hosts needs to listen for all the request, for example, imagine that you serve contents like barcelona.yourdomain.com and for newyork.yourdomain.com and whatever-changing.yourdomain.com like carlesmateo.yourdomaincom, anotheruser.yourdomain.com, anyuserwilhaveownurl.yourdomain.com, that your code process to get the information and render the pages, so it is not always possible to have a default one. First thing I had to do was, as the attack came from the ip, was to do not allow any host requests that did not belong to the hosts served. That way my framework will not process any request that was not for the exact domains that I expect, and I will save the 404 process time. 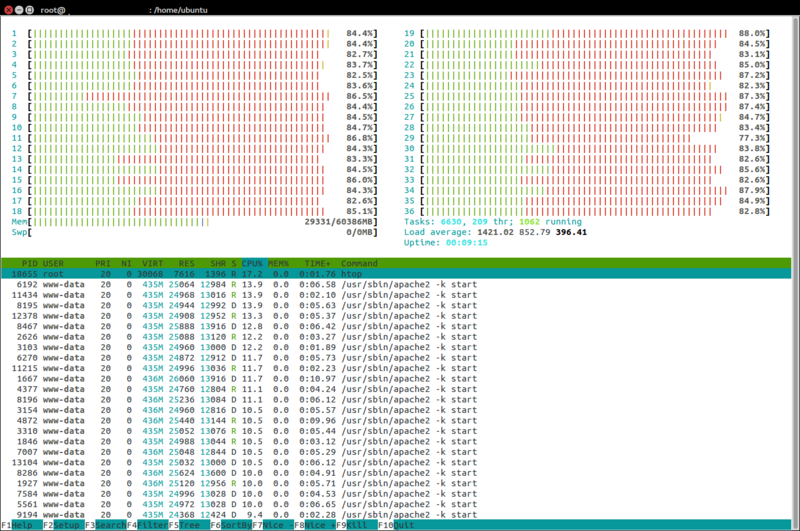 Also, if the servers return a white page with few bytes (header), this will harm less the bandwidth if under a DDoS. The bandwidth available is one of the weak points when suffering a DDoS. Nginx can easily block those requests not matching the hosts. That way any request that is not for the exact domain will be halted quickly. Optimization: If you want to save IOPS and network bandwidth to the storage you can create a ramdisk, and have the index.html of the default virtual host in there. This will increase server speed and reduce overhead. An emergency solution, drastic but effective, would be to block entire China’s ip ranges. Some of the webs I helped reported having attacks from outside China, but nothing related, the gross attacks, 99%, come from China. Sadly Amazon’s Cloud Firewall does not allow to deny certain ip addresses, only allow services through a default deny policy. I reopened the firewall in 80 and 443, so traffic to everyone, checked that the Service was Ok and continued my way to the office. When later I spoke with some friends, one of them told me about the Chinese government firewall causing this sort of problems worldwide!. Look at this interesting article. 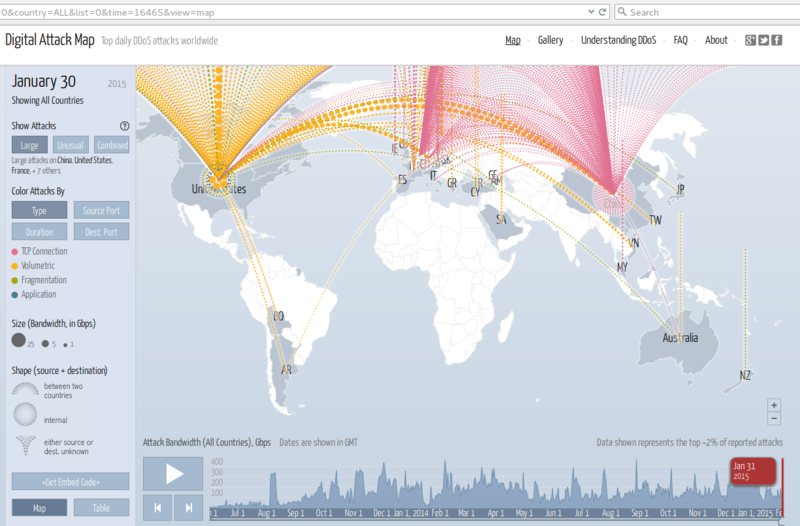 And China being the source of most of the DDoS attacks. This entry was posted in Bandwidth, Operations, Performance, Troubleshoot and tagged DDoS, DoS, iptables on 2015-02-01 by Carles Mateo.